Lakes and rivers are as much a part of Austin’s culture as music and breakfast tacos. But how does a city in drought-prone Texas protect its water resources? By harnessing the passion of its residents. As you start your descent on a flight into Austin, Texas, you notice two things. First is the sprawl that resulted when, over the past several decades, a former college town transformed into the tech and business hub it is today. Second, you notice the water. The meandering Colorado River snakes through downtown Austin, its banks lined with lush green trees and grass—surprising for a city that regularly (and increasingly) sees triple-digit temperatures. Northwest of the city are the Highland Lakes, a series of six lakes formed in the 1930s by damming the Colorado River, giving the city a reputation as an oasis in dry Texas. That water is key to Austin’s lifestyle. Locals walk and bike along the pathways lining Lady Bird Lake, paddleboard and kayak on its waters and swim in Barton Springs Pool, a spring-fed, three-acre pool that flows into the lake. All of Austin’s water supply comes from the Colorado River via Lake Buchanan and Lake Travis, both part of the Highland Lakes chain. “We see water all the time,” says Jill Mayfield, a public information officer for Austin Water, the city’s water utility. “People are constantly on the lakes fishing or kayaking or waterskiing. 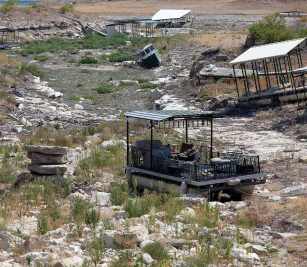 It’s such an important part of who we are.” A serious drought that spanned from 2010 to 2015 brought those lakes to alarmingly low levels. During that drought, Mayfield, who has lived in Austin since 1975, says the lakes were “as low as I’d ever seen them.” In 2015, near-record rainfalls ended the drought but also brought flooding and destruction in Central Texas. If anyone in Austin wasn’t concerned about the imperative of a sustainable water supply, that drought changed their minds—that, and the inescapable awareness of how much Austin itself has changed. Home to the 51,000-student-strong University of Texas at Austin, the city was mainly a laid-back college town that happened to also be the state capital until the 1960s and ’70s, when companies like IBM and Motorola started moving in, eager to hire UT graduates. But it wasn’t until Dell was founded here in 1984 and went public in 1988 that the city established itself as a true tech hub. Dozens of so-called “Dellionaires,” company employees made wealthy by stock options, founded businesses that drew venture capital to the region. 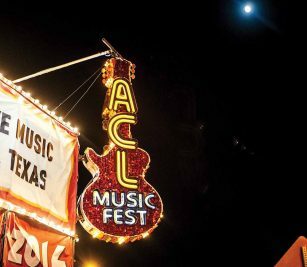 At the same time, a music festival called South by Southwest, launched in ’87, grew from around 700 attendees to the massive music, film and technology conference and festival it is today. The 2017 iteration spanned 10 days in March and drew more than 400,000 participants. South by Southwest has branded Austin as a center of innovation culture. Austin is now corporate or regional headquarters to massive companies including IBM, Whole Foods (which opened its first store in Austin), Apple, Google and Facebook. (Dell is still headquartered in Round Rock, a suburb.) Those firms and hundreds of startups draw young people, attracted by the city’s laid-back culture and lower cost of living than New York or San Francisco, in droves. But the city’s booming population—about 735,000 a decade ago and about 950,000 today—has placed unprecedented demands on its infrastructure and natural resources. “Austin is changing so rapidly that it’s almost difficult to think about comprehensively,” says Matthew Fajkus, an Austin native, associate professor at the UT Austin School of Architecture and founder of Austin–based MF Architecture. “The changes are mostly very exciting, but there has been runaway development—strip malls plastered into the countryside and suburban sprawl.” Highways are clogged with traffic during rush hour, and housing is increasingly unaffordable for the young people who make up Austin’s workforce. “The national theme about energy efficiency and fossil fuels is something to be concerned about, but we’re arguably more vulnerable in terms of water than we are in terms of energy,” says Fajkus. A 2007 study on water efficiency in Austin from 1983 to 2005 estimated the city’s current water supply could last through 2040, but aggressive water conservation strategies could extend that supply through 2050, buying the city more time to develop a longer-term plan. So preserving finite water resources and making sure the city can support its growing population has become a critical issue for city officials, architects and citizens. Their response is a case study in how a city can define its priorities, draw on its strengths and work to preserve its future. One of the first locals to start thinking about water sustainability is 89-year-old J. David Bamberger, a fried chicken magnate with a passion for Texas’ natural beauty. 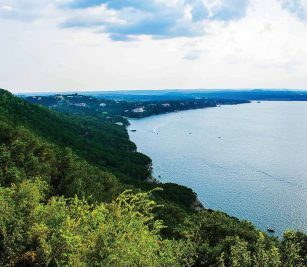 On his own land, 60 miles outside of Austin in Texas’ legendary Hill Country, Bamberger says he’s “preaching the gospel” of private land stewardship. The property, which Bamberger called Selah, Bamberger Ranch Preserve (Selah is a Hebrew word taken from the Old Testament; some, including Bamberger, interpret it to mean “to pause”), had been overgrazed and was overrun with woody species that cattle wouldn’t eat. Influenced by his mother’s love of nature and Pleasant Valley, a book by conservationist Louis Bromfield, Bamberger embarked upon what he calls habitat restoration on his property. He dug seven 500-foot-deep wells, but none hit water. So he started clearing thousands of acres of an invasive woody species called ashe juniper from his hills, spread usable soil, broke up the land by carving into the hillside in order to create a surface that could filter and absorb rainwater, and then he spread native grass seeds. He ran the risk of losing that soil in runoff if heavy rain hit, but the gamble paid off. Not long after the first major rainfall, grass started growing again. Two and a half years later, water started flowing from natural springs on the property. Decades after those first signs of water appeared, the property’s springs, creeks and water reserves sustain it, and the overrun from its water resources flows into the Pedernales River and eventually joins the Colorado River as it runs through downtown Austin. “There’s no reason whatsoever that this can’t be done on every property in the state of Texas,” Bamberger says. Bamberger opened his ranch to visitors and started sharing his experiences. Now, Bamberger Ranch Preserve hosts more than 3,000 visitors a year, a mix of students and landowners who want to learn from Bamberger and his staff. Daylong seminars with landowners focus on water, land stewardship, native grass and wildlife enhancement. Some of those regulations dictate what percentage of a new structure can be “impervious surfaces”—roofs and driveways that can’t absorb rainwater the way grass or gravel would. Austin Water, a 100-plus-year-old utility that’s been implementing conservation programs in the city for decades, has gotten increasingly aggressive about water conservation. In 1974 Austin Water first presented the Reclaimed Water Program, which has become more robust in the past 10 years. It introduced conservation guidelines in 1983 that were updated last year, and it is constantly repairing and updating aging infrastructure to reduce water leaks. In 2017, Austin Water named June 22 the city’s Water Conservation Day to spotlight the fact that individual water use has dropped 35 percent, from 190 gallons per day to 122, since 2007.